Viktor&Rolf Spicebomb Fragrance Review: Is This The Best Christmas Cologne For Men? Released in 2012 to much acclaim, Viktor&Rolf’s iconic grenade-style bottle has gone on to be one of the most recognisable winter fragrances for men. 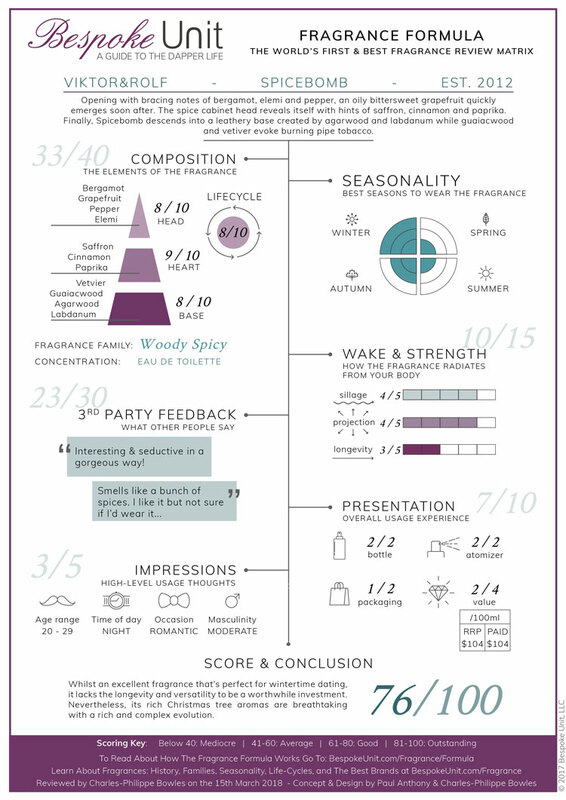 In this review, we’ll be using the Bespoke Unit Fragrance Formula to put Spicebomb to the test. In this article, we’ll evaluate its composition of notes, seasonality, performance and value for money. You’ll also learn when and how it can be worn throughout the year. Following the success of the women’s fragrance, Flowerbomb, Viktor&Rolf approached the prestigious Olivier Polge to create another concoction. With works including Dolce & Gabbana The One and Burberry Brit Rhythm, Polge is well-known master of woody and balsamic fragrances for both men and women. Designed to be an unashamedly extroverted and fiery fragrance with a plethora of leathery, tobacco and bittersweet accords. With a plethora of fruity, aromatic and spicy accords, Spicebomb could easily be an intense Oriental fragrance. However, its decidedly woody base renders it a Woody Spicy fragrance. At first, Spicebomb begins its journey as a vibrant and fresh fragrance. The first notes to hit the nose are bergamot, elemi and pepper, which makes a bracing start. Whilst the elemi creates lemony and pepper notes, these are extended by the bergamot and pepper itself. Shortly after, bitter grapefruit begins to emerge, which create and oily addition to its opening character. Shortly after, the head cooks away only to leave the elemi and grapefruit. We’re then introduced to a rich blend of saffron, cinnamon and paprika. This spice cabinet heart retains the citrus peppery character of the elemi as well as the balmy grapefruit. Warm vetiver acts as something of a precursor to Spicebomb’s rich heart. Eventually a leather accord is created by the Agarwood’s oudh and musky labdanum. Meanwhile, the burning leaf aromas of the guaiacwood create an accord with the vetiver that is reminiscent of warm tobacco. Spicebomb is an overall conventional fragrance that features transitional notes between the head, heart and base. The combining notes rarely work independently but create rich and tangible accords together. As for the fragrance’s performance, it’s potent during its lifetime. However, a short longevity may let it down. During its few hours of presence, it offers a powerful sillage, which leaves a distinctive trail behind the wearer. Similarly, the projection is effective and can be smelled from a good few metres away. Do People Like Viktor&Rolf Spicebomb? Overall, people tended to agree that Spicebomb was a rich and pleasant aroma that evoked the wintertime. Maybe people likened it to pot pourri and Christmas spices, which they seemed to love. However, this distinctive character wasn’t always received as positively as you may hope. There were a few comments that while it was a nice smell, it would be better used to scent a room during the festive season. The same people thought that it would be a bit distracting when worn on somebody as a fragrance. However, the people that did have these comments tended to be over their thirties. In fact, those who enjoyed the fragrance less were all a little older. Conversely, it proved to be very popular among younger people from their teenage years up to their mid-twenties. When Should You Wear Spicebomb? 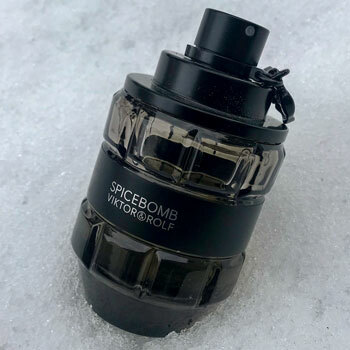 Unsurprisingly, Spicebomb is a definite fragrance for the winter. Although it offers some performance during autumn, it’s completely ineffective during the spring and summer. Therefore, this is something that can only be best worn during a particular time of the year. Meanwhile, it’s very much a younger person’s fragrance. Anyone during their teenage years could wear this. However, it seems most suited to those in their twenties. Any older than that and it may seem a touch out of place. As for the occasion and time of date, this would be an ideal fragrance to wear during those cold winter nights. The fragrance will easily warm you and your entourage up by a good few degrees. Furthermore, it can be worn casually or even for more romantic encounters. Therefore, wearing this on a night-out is an ideal choice. Nevertheless, it can be worn during the Christmas festivities or even when out shopping in preparation. Finally, while Spicebomb is relatively masculine, it’s not overly so. In fact, Spicebomb is a relatively moderate fragrance in that regard. This might be good news for some and especially those of a younger demographic as it wouldn’t come across as too bold. Spicebomb’s iconic bottle is instantly recognisable and hard to miss. Designed by Fabien Baron, it resembles a hand grenade so it truly fulfils its name as the “spicebomb”. Additionally, the atomiser features a small tag that you can remove like a pin from a grenade. This is similar to Jean-Paul Gaultier Ultra Male’s tab but somewhat more attractive. As for the packaging, it’s not overly memorable nor is it underwhelming. The box is simply presented as a silvery-grey cardboard with a black band in the centre. The name and firm are then printed over this black band in silver. However, it’s the bottle itself that really stands out. Love it or hate it, you have to admit that Viktor&Rolf have tried something new. Finally, Spicebomb’s value for money is a tough one. If you’re looking for a specifically wintery fragrance, it’s among the best along with Armani Code and Dolce & Gabbana The One. In fact, you can view our recommendations for this season by checking out our guide to the best winter colognes for men. Nevertheless, Spicebomb is a pricey fragrance. The cheapest we could find it was either $85 for 100 ml or $55 for 50 ml. In either case, it’s still well under the $100 for a season-specific fragrance. If you feel that it’s worth it, we couldn’t recommend it more. Spicebomb is a fragrance that leaves a memorable impression on both the wearer and his entourage. If you’re a younger man looking for something that truly captures the festive essence of Christmas, then this is a fragrance that we couldn’t recommend more! Its rich harmony of balsamic resins and powdery spices is elegant and bold. Spicebomb is therefore a fragrance that should be used with caution and enjoyed by those who have the confidence to pull it off! "An intensely seasonal experience. If Spicebomb was anymore festive, it should be hung up on a Christmas tree!" This is a complement monster! I was not a huge fan upon initial purchase, but as noted above I get so many complements on this. Absolutely! Whilst it’s not our favourite fragrance, it does get a ridiculous amount of compliments during the festive season! For me too it’s a complement monster! 100% in the winter rotation. I also wasn’t a fan at first sniff but started to miss smelling it every now and then and eventually bought it. If you get a chance to try the Extreme, I’d recommend it. There seems to be one note that makes it a little less harsh to the nose and I think I prefer it over the original…..but just barely. However, I’m on the fence as to whether they are different enough to own both. Thanks for the comment. I’ll have to give Extreme version too. I’m perfectly happy with the original, but if they are slightly different may be worth it for different occasion / change from the seasons.